Vicki Trott presented at our breakfast meeting last Thursday. 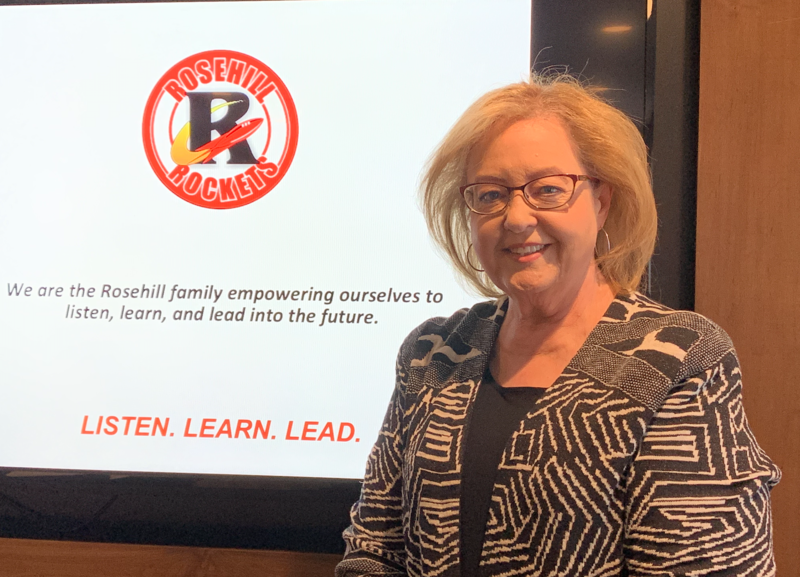 Vicki participates in a partnership between Rose Hill school and Caring for Kids, volunteering her time to help provide learning resources to students (pre K through 6th grade) attending Rose Hill. Rose Hill is a Title I school with an ethnically diverse population that includes thirty-five percent English language learners. Our club meets on Thursdays for breakfast at 7:30 a.m. In short, we netted $11,533.29 from Oktoberfest 18. The club typically keeps between 10%-20% to seed future foundation efforts so this year we elected to retain $1,533.29 leaving $10,000 to distribute to the 2 charitable recipients (Hot Lunch Inc. & Growing Futures) Since the primary sponsor of $2,500 was brought in specifically for Hot Lunch Inc. we felt that they should receive a proportional cash distribution recognizing that contribution. From that, we arrived at a 70/30 % split ($7000 to Hot Lunch Inc. with $3,000 to Growing futures). In addition to this, we elected to take the $1,500 we retained and use it to fund our matching grant for books earmarked for Growing Futures which would equal a total additional contribution to Growing futures of $3,000 of books. With this, the realized split becomes $7,000 to Hot Lunch Inc. and $6,000 to Growing futures representing a fair and balanced distribution to our two designated beneficiaries. If you wish to participate but did not have a chance to signup, or if you have a conflict with the date, please inform Shelly Tehven. Have you been to our new digs at the Holiday Inn Suites? That’s where the Rotary Club of Johnson County now meets. It’s the place we met for years as a large club and a good place for our small club to grow again, just east of the intersection of I 35 & 87thSt Pkwy. In fact, bring a friend to Rotary on Thursday morning for good food and fellowship. As you enter the front doors, walk down the hallway past the swimming pool and then, turn right to the Wyandotte room. It’s time for you to enjoy with us the glow of a very successful Rotary year so far. Thousands of people have been helped already and the Rotary year is just past the half-way point. It’s also time to bring a friend and introduce him/her to the wonderful world of Rotary and the many ways we help the world. We just cannot have too many Rotarians!